Our pedigree over the past 30 years covers every single aspect of print. We have provided print collateral in every shape and size across a huge array of products for every area of advertising, marketing and promotion. 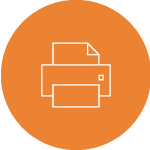 Drawing on the expertise of our team, we’ll work with you to develop your proposal into a complete, fully formed print solution. Whether it’s a one off project or an ongoing campaign, our services can support you every step of the way. With a full service design studio in-house, we’ve come up with creative solutions for every problem. This allows complete line of sight through every project – from initial concept to final delivery. From leaflets to merchandise and everything in-between, we’ll source innovative products and introduce exciting print ideas to ensure your marketing collateral is the best it can be. We provide retail point-of-sale in almost any shape, size and format. With our expertise, you can be sure that your POS unit will really stand out. With 27,000 square feet of warehouse space, we have the infrastructure and capacity to hold your bulk print runs and pick and pack your smaller lines. Our proprietary cross-media software allows creation of all-inclusive marketing campaigns and our network-wide online print ordering system maintains the integrity of your brand through “controlled flexibility”. We ensure the right message is delivered to the right place at the right time. As your partner, we’ll take care of all aspects of the service including mail-sort, data security, and match mailings – we’ll even pack and post everything ourselves.